Plant seedlings with root clods or directly to the regular spot. It grows at above 5 °C (41 °F), optimum temperatures for growth and development being around 18 °C (64 °F). In hot days, provide shading for the seedlings or transplanted plants. Cut a part of the leaves of the seedlings without the root clod. Don’t cover with garden fabric until night temperatures don’t fall under 0 °C (32 °F). At least 40 cm (15 in) between rows and at least 40 cm (15 in) between plants in a row. Two to four plants per person in one planting. Fertilize with home compost and wood ash, and water occasionally with comfrey or algae brew. It needs regular watering to make the leaves softer. Broccoli, zucchini, beans, peas, Chinese cabbage, kohlrabi, leek, cabbage, dill. Wireworms, root lice, fungal diseases. Cut regularly when needed. It can survive as low temperatures as -5 °C (23 °F). To store, pull the whole plant out, clean the roots (don’t wash with water), wrap into newspaper and hang with roots up. Use fresh leaves. Boiled can be used as well in some dishes. They contain vitamins, minerals and quite a lot of fiber. Keep the soil soft. 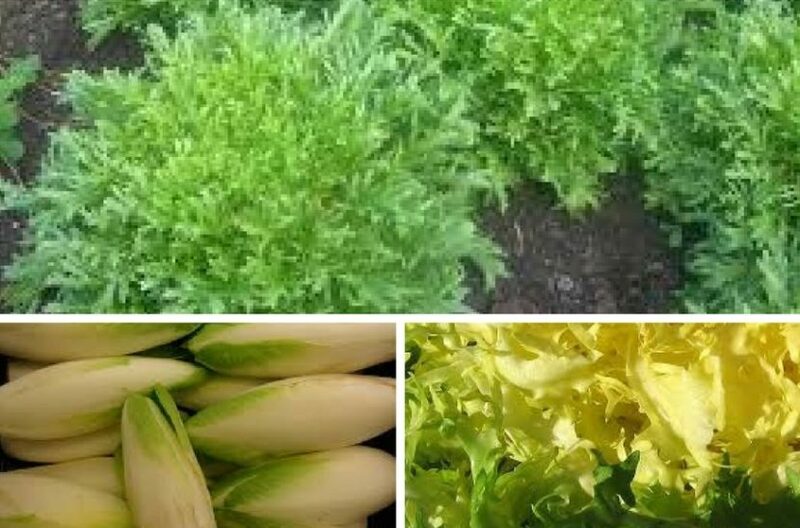 There are two main varieties, escarole endive and curly endive, the second being more resistant to disease, drought and excessive moisture. It is sensitive to the length of the day and should be sown in early spring and June (to use in fall). It is a near relative of radicchio, but is often called lettuce mistakenly.